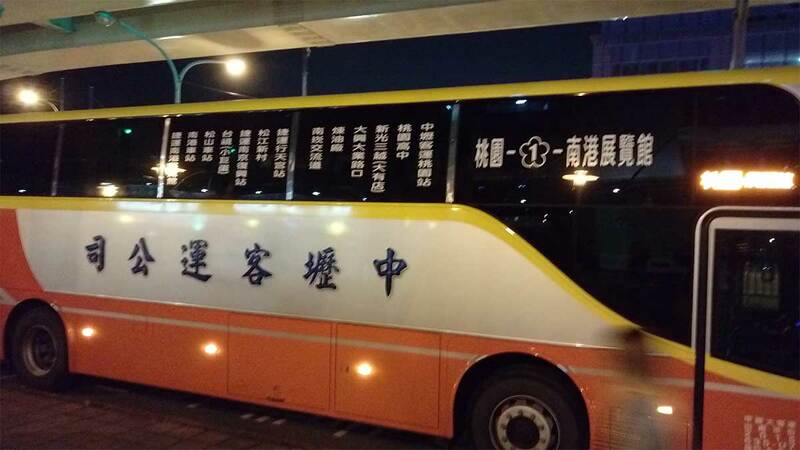 Here’s a photo (blurry, I know) of the side of a bus in Taipei. I took this because the bus has text in Chinese characters running in three different directions: top to bottom, right to left, and left to right. Taiwanese wouldn’t find this particularly confusing, as this sort of thing is not entirely uncommon here, though right-to-left horizontal writing is seen less and less. I’m posting this mainly so I can refer to this example later if need be. This entry was posted in Chinese, Chinese characters, general, Mandarin, Taipei, Taiwan by Pinyin Info. Bookmark the permalink. And of course in this unusual case, the order in which the vertical text is to be read is moot: it depends on the direction of the bus. I’d argue that technically speaking (the best kind of speaking) that third one should be classed as “front to back” rather than “right to left” (the latter being an incidental consequence of the former). I once saw a store sign in Táiběi that read bottom to top. It didn’t seem especially marked, either. Wish I had been able to take a photo of it — would’ve completed the set. Yes if you walk around to the other side it will be opposite. It is made to be readable if the bus is passing by your small window. Highway markings are read from bottom to top. The right lane reads ??? for “slow lane” while the middle lane reads ??? for “fast lane”.